Is there an 'Austrian identity' in contemporary music? The ensemble Intégrales, intent on securing evidence, commissioned five original, or even out-of-the-ordinary, composers to come up with made-to-measure outfits for the ensemble. And lo and behold!, there they are, these identities of Austrian sound languages. The new 'alpenglow' on the musical horizon combines five pieces that defy any standard modern music evaluation criteria and explore wholly new spaces of sound with their musical gestures. The ensemble Intégrales weaves fine-meshed kinetic nets in Christof Dienz's AMPLIFLY, sends out improvisations into the ether with the support of computers (Karlheinz Essl, more or less), drags an ark of sound across the mountains until only a microtone echo remains (Wolfram Schurig's A.R.C.H.E. 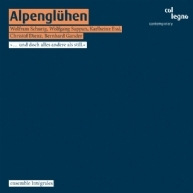 ), unreels technical data cantatas in Bernhard Gander's king's message, and accompanies Webern into the here and now with aphoristic sound sequences (Wolfgang Suppan, weiten und male). The superb musicians of the ensemble Intégrales attend to the music of the middle generation of Austrian composers and bring to light original traits that cannot be found anywhere else in the world. Alpenglow indeed.